What separates Body by Giuliana from other workout facilities is PRIVACY! You will never have to wait for a piece of equipment or feel intimidated or uncomfortable by unwanted eyes. There is only you and your trainer Julie. There are no membership fees or orientation fees, the only thing you have to pay for are your personal training sessions. Body by Giuliana offers one on one training or discounted rates if you want to workout with a friend or two. First time clients receive a complimentary session. 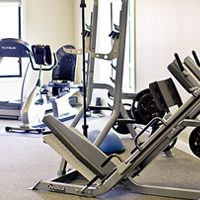 The best way to decide if Body by Giuliana is right for you is try out her facility. We will go over your goals, medical history and take you through a workout/evaluation. Once you are a client…you will receive not only increasingly challenging and progressive exercises, but also nutritional guidance and to make sure you stay on track, we record your progress through measurements and body fat analysis every few weeks. Just call 248-909-8425 to schedule your complimentary session today!